Cooking for Chemo: What is Roundness of Flavor? Chef Ryan’s Roundness of Flavor Chart: Balancing salty, savory, spicy, sour, and sweet flavors when cooking for cancer patients during and after treatment. One of the most powerful tools in the cancer fighters arsenal is the ability to identify and compensate for the taste and flavor changes that occur during cancer and chemotherapy treatment. In my cookbook, I teach you expert and professional cooking methods to combat these flavor changes. The most profound concept being a series of flavor techniques and ideas that I call Roundness of Flavor. Roundness of Flavor is best described as a holistic view of the entire eating and tasting sensory experience. Now, when I say holistic, I do not intend to use it in the modern sense of the word which generally refers to vegetarianism, organic process, or alternate medicines. I mean holistic as in taking all factors and treating them as a whole. When you eat, you perceive food with not just one but with all five senses. You see the food. You hear the sound that the food makes. You smell the food on your plate. You feel the temperature and texture of the food on your mouth and on your lips. And you taste the food when it is inside your mouth. So now, let’s explore each sense individually. What you actually taste when you eat are 5 primal flavors which are: Salty, Savory, Spicy, Sour, and Sweet. Each one of these basic taste sensations lends itself as a piece of the whole sensory experience. Cancer and chemotherapy treatment diminishes the perception of these flavors. You have to remember that chemotherapy is like an atomic bomb- it affects every aspect of every system in your body. Beyond this, chemotherapy’s main taste side-effect is an ever present taste of metal in your mouth. (Now, this does not happen to everyone because all people are different and there are uncountable varieties of cancers and treatments.) The best thing we can do is to find which of our 5 taste senses is unbalanced and adjust for them in our cooking. For example: My mom preferred to eat foods that were a little extra sweet and a little extra savory. By adjusting your seasonings for these flavor changes, you can easily overcome your flavor challenges during and after cancer and chemotherapy treatment. The true main player in the eating process is not actually taste, but sense of smell. After you are diagnosed with cancer and begin chemotherapy treatments, you will become aware of changes to your sense of smell. Because your sense of smell can differentiate over trillions of unique scents, you can build richer sensory experiences through smell than you could ever through taste. But because your sense of smell and taste are so interlinked, unless we separate the two, we would never notice their interdependence. Smell is such a powerful sense that when you think of memories in your mind, you can actually remember the smell that the event had. Think about your grandfather’s cologne or the way Thanksgiving dinner smells. If you really concentrate, you will notice that as you think of these memories, you can actually re-smell the events in your mind as if they were happening right now. We want to use this to our advantage when cooking for someone going through chemotherapy. We can take advantage of the sense of smell by using aromatic herbs and spices in our cooking as well as avoiding pungent odors that your loved one with cancer finds offensive. Another major player during cancer and chemotherapy treatments is your tactile sense or sense of touch. This factor comes into play in the guise of heat sensitivity, mouth dryness, and mouth sores. These are all unfortunate but common side-effects of chemotherapy. Considering these side-effects is extremely important as their pain and discomfort can completely overpower the pleasure from the eating experience. This can lead to dehydration, malnutrition, and starvation. So, we must compensate for these effects when we think of a recipe or meal as a whole. Another factor that touch has while eating is a concept that I refer to as the weight of a dish. Weight is the perception of thickness, density, viciousness, or actual physical heaviness from your food in your mouth. When cancer patients eat food, because the taste and smell are diminished as a chemotherapy effect, the major sensation you are left with is your sense of touch. As a result, soft but heavy textures like oatmeal, shepard’s pie, or pot roast may feel suspiciously heavy in your mouth and as a result make them unappetizing. When you combine this with the sensitivity caused by mouth sores, you end up with a recipe for disaster. The two best ways to compensate for these changes during cancer treatment are to 1) be conscious of the heat, texture, and roughness of food items as these can exacerbate the problems caused by mouth sores- and 2) we can incorporate a tablespoon or two of red wine vinegar and an equal amount of sugar when cooking to limit the weight of the dish and eliminate the perception of heaviness in your mouth. This will allow you to get more nutrients into you or your loved one when you eat while battling cancer. Sight is an important factor because it is the only other sense besides smell that will make you disinterested in a meal from a distance. The sight of food can even go so far as to make you nauseous and lose your appetite. One of the things that I did for my mom while she went through chemotherapy for breast cancer was to make certain that every recipe I made had a variety of brightly colored and fresh but cooked vegetables inside the dish whenever possible. Brightly colored vegetables in dishes pre-load your brain with the idea that what you are about to eat is fresh, light, and healthy. Sound has several uses during eating and cooking. You can use this to your advantage when cooking for your loved one going through cancer treatments. The most important of which is its ability to train people who are going through chemotherapy to experience hunger using classical conditioning theory. When I was my mother’s caregiver, before every meal, I would always saute garlic. And based on the location of the kitchen in our house, the sound and smell of sauteing garlic would happily waft its way up the stairs to my mother’s room and entice her with the delicious promises of food coming for breakfast, lunch, or dinner. This conditioned by mom’s brain to associate the sound and smell of sauteing garlic with meal time. This subconsciously prepared her mouth and stomach to receive those vital nutrients that chemotherapy and cancer patients so often miss during treatment. I highly encourage you to use these types of techniques in your cooking so we can get just one more spoonful into your loved one battling cancer. By taking all of your senses and understanding their applications as a holistic view or as a whole item, you can begin to provide a better standard of living and a better level of care for your loved ones battling cancer as they go through chemotherapy. As I have shown here, addressing one issue like metallic tastes is not sufficient to compensate for the breadth of side-effects that cancer treatments cause. We must address the body and eating as a holistic concept and not as 5 independent senses that work independent of each other. 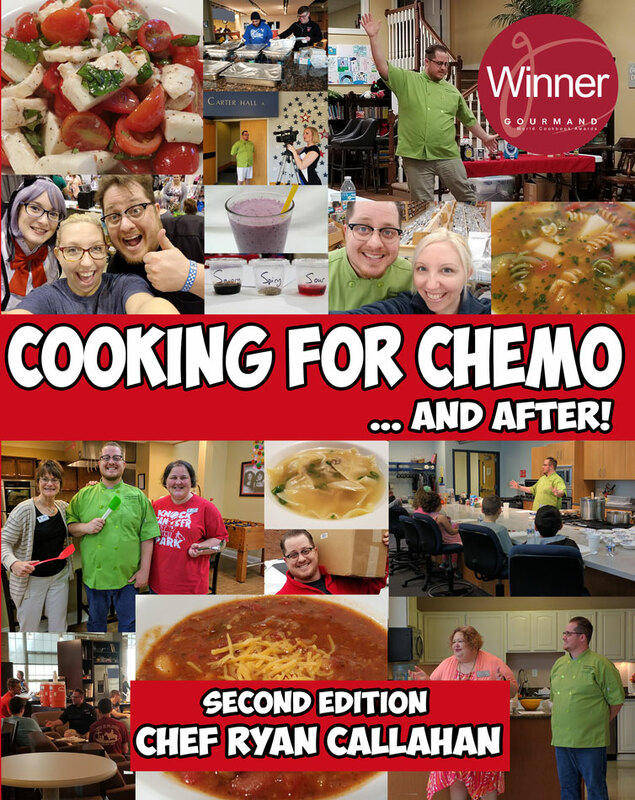 For more information on how to use Roundness of Flavor during and after cancer and chemotherapy treatments, you can check out my cookbook, Cooking for Chemo…and After! I cover this topic in great detail.